These questions have a very practical application, since knowing the trial types, its variants, links and derivations, its modalities and the way they are signaling will allow us to orient ourselves on the road and recognize our path as we walk. The first division of the trails is established according to the homologation. Thus, the approved trails are those that have been registered, authorized and signaled by the FEDME (Spanish Mountaineering and Climbing Federation) and the FFAA (Autonomous Federations). That does not mean that the non-approved are in worse conditions or more dangerous, is just that they are not officially registered (yet). They are short, less than 10 km trails and of low-level difficulty. 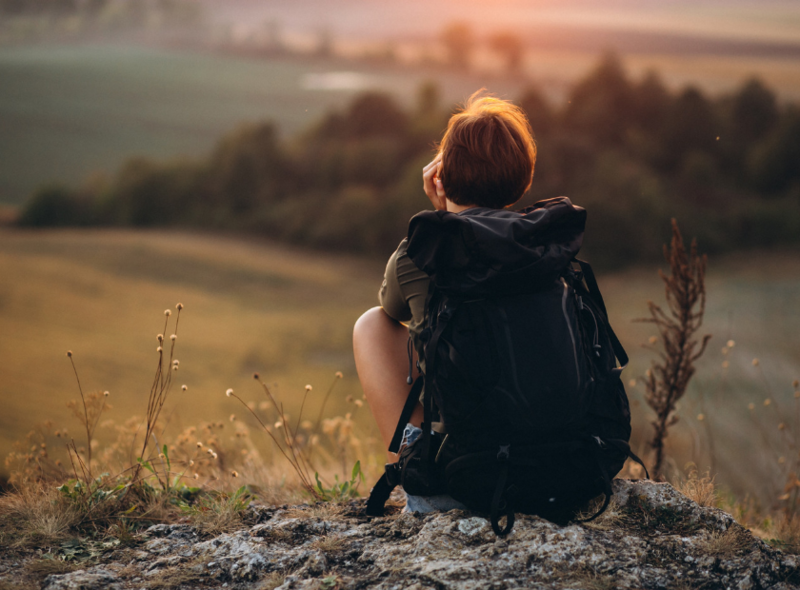 That makes them suitable for family travels, without the need of sophisticated equipment, physical preparation or previous experience in hiking. 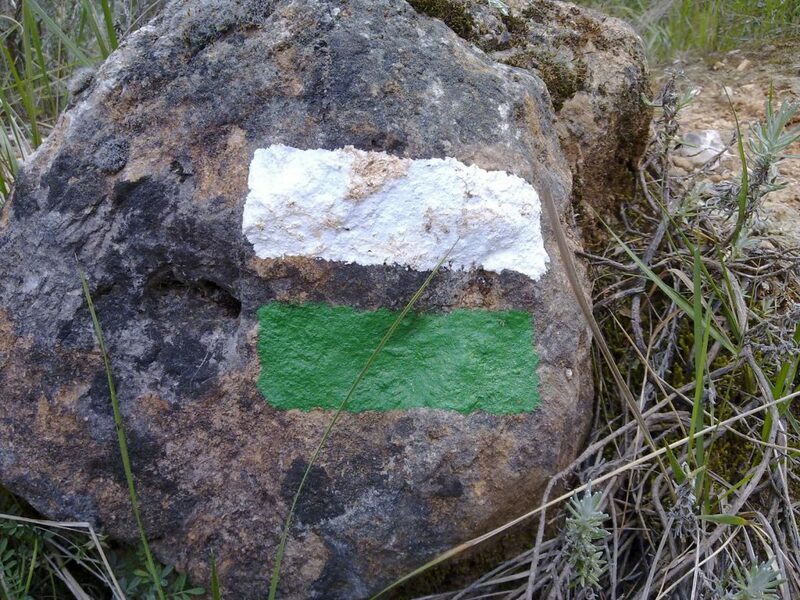 They are marked with white and green stripes, and are managed by the FFAA and Territorial Federations. Most of the hiking trails in Spain belong to this category. Its extension does not exceed 50 km, so they are designed to be traveled within a single day. They are marked with white and yellow stripes and are also managed by the FFAA and the Territorial Federations. Any route that exceeds 50 km belongs to this category, and as most of the time they traverse several municipalities, provinces and even regions are managed by FEDME. Identified with white and red stripes, they require several days to be completed, so it is necessary to face them with a well-provided backpack and everything you need to spend the night. A GR trail becomes a European Trail (E), if it passes through at least three different countries, and will be managed by the ERA. Then, approved trails can have variants, links and derivations. Let’s review each of them. Variants are paths that start on a main path and return to it later. They are numbered as the main path, then a point and a number. Links are trails that join other approved trails, regardless of the rank they have. Are handled by the FEDME and can even link to trails in two different countries. Finally, derivations are sections that start from a homologated path and lead to interesting sites: monuments, natural sites, historical sites, viewpoints, etc. The FFAA are the ones who manage them. To signal a trail, 4 fundamental marks are used: continuity, path variant, change of direction and wrong direction. 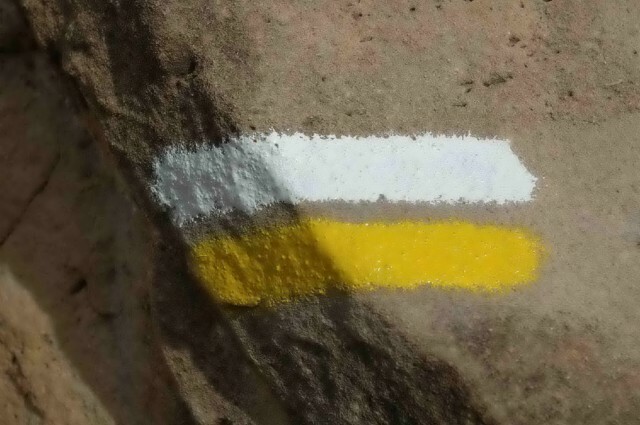 It consists of a white line above and another of the color corresponding to the path below. If two paths merge in the signal, the one with the highest rank is signaled first. 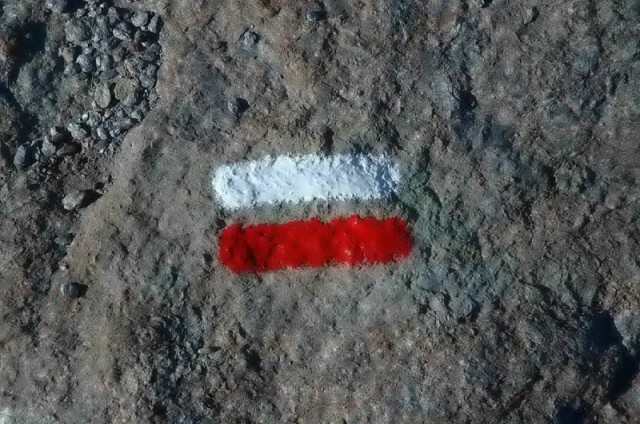 That is, a section common to a GR path and a PR, is marked with a white, red and yellow stripes. Same as the continuity signal, with an inverted ele below blank. It is used when the road is left to take another. It is marked with two parallel lines that simulate the direction of the change. It is placed at the beginning of a path that should not be taken. The colors of the trail type are used in the form of a cross, with the strip running from the lower left end to the upper right. It is carried out in little unevenness terrains, without big slopes. It is usually done in well-defined trails with good signage, since it aims to sightseeing the natural landscape of the area. With good footwear, appropriate socks and a raincoat in the backpack, it can be done without difficulty. Unlike the previous one, it is characterized for being done in great unevenness areas, with narrower paths and on different terrains (dry, slippery, stony) that offers a certain level of difficulty. It is recommended to wear protected shoes with lot of grip, canes and raincoat in the backpack in case the weather changes. As in mountain hiking, but giving more speed to the walk. The paths can be defined or not, which gives the attraction of having to decide your own trail. The footwear must be light but also have good grip, while the clothing must be breathable. You should use a very light, adjusted to the body backpack, to get more speed. It is done on snowy trails, not too complicated. Snowshoes are used to walk, but not crampons, because the goal is not to conquer peaks. Of course, the footwear must be waterproof and insulating, and also you need to wear sun glasses, warm clothes, gloves, hat and canes. Important information regarding to trails is also given by the MIDE (Information Method of Excursions) that tells us about the characteristics of the road ahead. 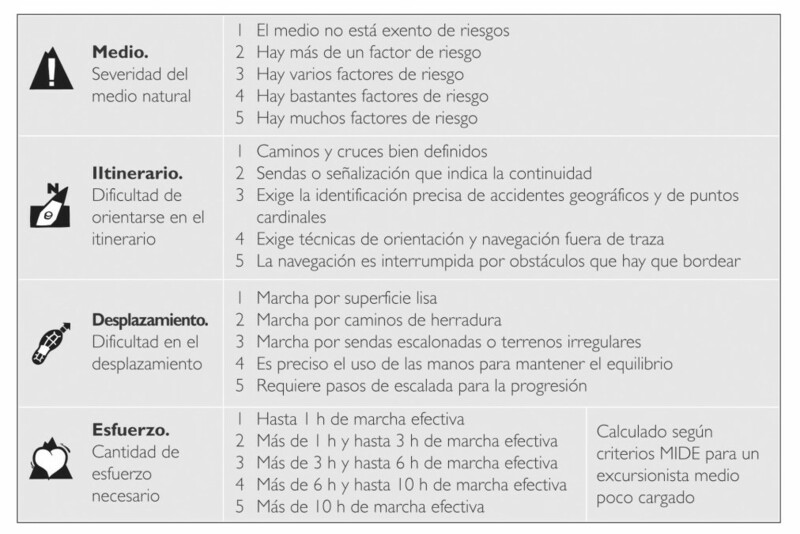 In it we find the reference information, which includes the name of the excursion, starting and ending points, points of passage, the ideal time to perform, the positive and negative differences, the horizontal distance, the type of route and the time of year that is most suitable to be carried out. Media: conditions in the natural environment for the hiker. Itinerary: the difficulty to orient yourself in the field. Displacement: how difficult it is to move on the route. Effort: the number of effective walking hours that are needed to complete the path, for a half-loaded hiker. From 0 to 1,000 meters, Low Mountain or cabañeras. From 1.0 to 2.5 kilometers, Half Mountain and they are called forest tracks. At more than 2,500 meters we are in the presence of the true High Mountain trails. 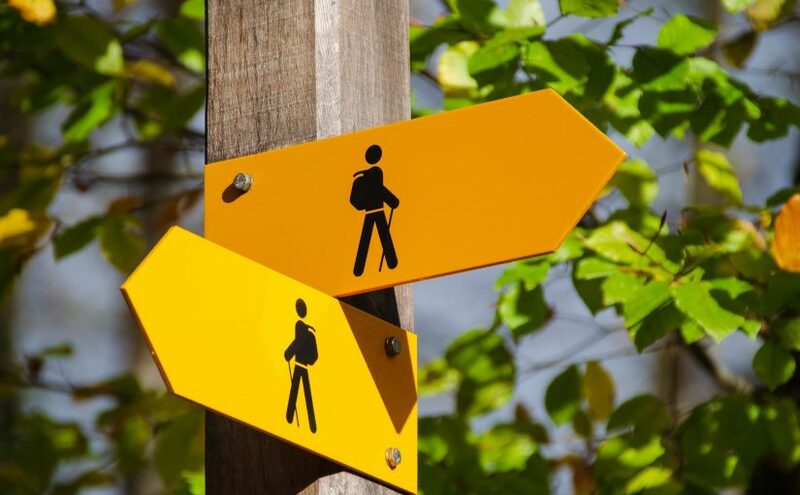 So now, you are ready to face your next hiking trail more informed.